ESSU research has consistently focused on the offshore infrastructure funds, which are liable for corporate tax in the country in which they are registered. 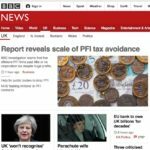 Each PFI/PPP project has Special Purpose Vehicle (SPV) or company that is registered in the UK and liable to pay UK corporation tax. Twelve offshore infrastructure funds had equity in 547 UK PFI/PPP projects. These offshore infrastructure funds had equity in 74% of the 735 UK PFI/PPP projects (October, 2016). Furthermore, the offshore funds have a significant influence when they own a majority of the equity in a SPV. Nine funds owned 50%-100% of the equity in 334 PFI/PPP projects or 45.4% of PFI projects in the UK. Education and health projects account for two thirds of PFI/PPP projects in which offshore infrastructure funds have 50%-100% of the project equity (Whitfield, 2016). The Table Annual profit and taxation of listed infrastructure funds 2011-2017 details the annual pre-tax profit and tax paid by five offshore registered infrastructure funds – HICL Infrastructure Company Limited (Guernsey), John Laing Infrastructure Fund Limited (Guernsey), 3i Infrastructure plc (Jersey), International Public Partnerships Limited (Guernsey) and Bilfinger Berger Global Infrastructure SICAV (Luxembourg). Each PFI/PPP project has an SPV, together with a holding company, which is responsible for the design, finance, construction and maintenance of new public buildings. The construction company, bank or financial institution and facilities management contractors are the shareholders of each SPV. They also usually contribute a portion of subordinate debt at relatively high interest rates to the project, although this is small relative to the senior debt provided by banks. Local authorities, NHS Trusts and other public bodies repay these costs via regular unitary payments. The SPV pays UK corporation tax, but receives significant investment allowances which reduce the level of tax paid. It also pays annual dividends to the SPV shareholders financed out of profits. The sale of equity in SPVs has soared. The updated ESSU PPP Equity Database records 462 transactions between 1998-2016 involving the direct sale of equity of 1,003 projects (including those where equity was sold multiple times) at an estimated cost of £10.3bn. The average annual rate of return was 28.7% in 1998-2016 more than double the 12%-15% annual rate of return in PFI/PPP Final Business Cases. In 2016, 100% of equity transactions involved offshore infrastructure funds registered in Jersey, Guernsey and Luxembourg, based on the ESSU sample of 334 projects. The percentage in 2011 and 2014 was 70% for both years and 60% and 61% in 2015 and 2013 respectively. All or part of a SPV shareholders equity and subordinate debt is sold in a transaction. After the sale of equity, the SPV pays dividends to the new equity owners that has led to an increasing flow of money going offshore. SPV equity also changes ownership when secondary market infrastructure funds takeover or merge with other similar funds. The Financial Commodification of Public Infrastructure details 33 transactions involving 1,151 SPVs between 2003-2016. The five largest listed offshore infrastructure funds made a total profit of £2.9bn in the five-year period 2011-2017. They paid a total of £13.5m taxes or a tax rate of 0.47%, when the £21.2m of tax credits is included. The five funds collectively paid ZERO corporate tax in the offshore territories where they have been registered for six years. Two of those funds published accounts to include 2017 and jointly paid no tax in the seventh year. This represents a potential loss of over £600m in UK tax revenue had these companies been registered in the UK (based on UK corporation tax rates of that have declined from 26% in 2011 to 19% in 2017. Ottawa (06 Nov. 2017) — Because of their use of tax havens, 4 companies with extensive investments in Canadian P3 privatization schemes paid less than 1 per cent in income tax in 2016. A lot less. Between them — International Public Partnerships, HICL Infrastructure Company Limited (HICL), Bilfinger Berger Global Infrastructure (BBGI) and John Laing Infrastructure Fund (JLIF) — own, or partially own, 22 P3 privatization schemes in Canada. These include P3 schools in Alberta and the Vancouver General Hospital Academic Ambulatory Care Centre. In 2016, the before-tax profits of these 4 companies added up to $981.5 million. However, the total tax bill was only $1.2 million or 0.12 per cent. The reason for such low tax bills is that all of these investment companies have their headquarters in tax havens — 1 in Luxembourg and 3 on Guernsey in the Channel Islands. “Thanks to P3 privatization schemes, money that should be funding quality public services is ending up in tax havens,” said Larry Brown, President, National Union of Public and General Employees (NUPGE). Published on 27th October 2017. Last updated 11th November 2017. A sample of 334 projects, a third of the total number of projects engaged in the sale of equity in 118 transactions, a quarter of the transactions between 1998-2016, provides information to determine the annual rate of return. The average annual rate of return was 28.7% in 1998-2016 more than double the 12%-15% annual rate of return in PFI/PPP Final Business Cases. Education and health PPP projects account for 62.7% of projects in equity transactions followed by transport with 10.4% and criminal justice with 8.4%. In 2016, 100% of equity transactions were to offshore infrastructure funds in Jersey, Guernsey and Luxembourg, based on the ESSU sample of 334 projects. The percentage in 2011 and 2014 was 70% for both years and 60% and 61% in 2015 and 2013 respectively. Published on 11th October 2017. Last updated 2nd November 2017.